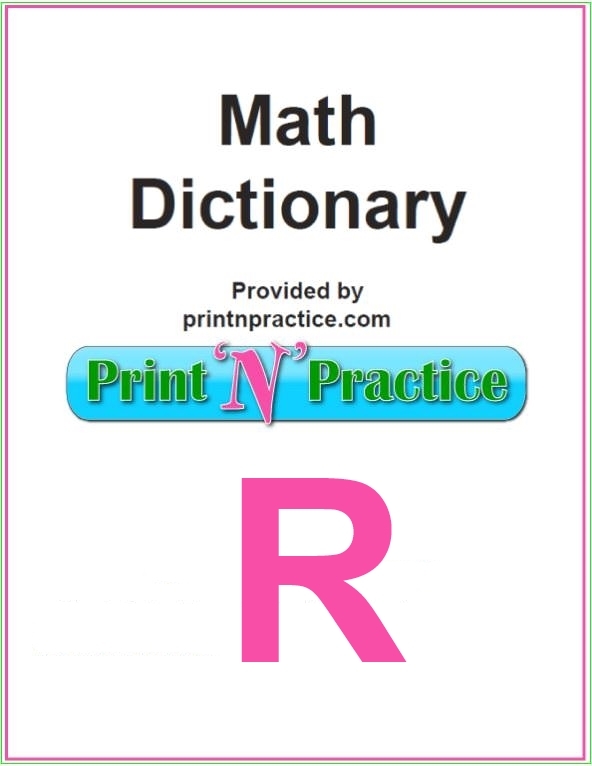 Our Math Dictionary words that start with R has the Math terms that start with the letter R. Start here with Math definitions that we have gathered from a half dozen Math books, including a very old one. 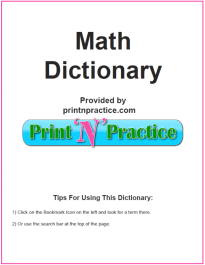 Math Words That Start With R: Supplement your math glossary with the math dictionary that you can print below. Radian - a special unit of measure that measures things that are circular. Radical - a root of a number. Radical Axis - the locus of points of equal power with respect to two circles. Radical Center - the radical center of three circles is the common point of intersection of the radical axes of each pair of circles. Radicand - the number inside the radical sign. Radii - plural of radius. Radius - the length of a straight line drown from the center of a circle to a point on its circumference. Radius of a Circle - a line segment starting at the center and going to the outer edge of the circle. The radius is half of the diameter. Radix Point - the generalization of decimal point to bases of numeration other than base 10. Rationalize the Denominator - a process that gets rid of the radical in the denominator. Ray - a straight line that begins at a point and continues outward in one direction. Random Number Generators - a device used to produce a selection of numbers in a fair manner, in no particular order and with no favor being given to any numbers. Range - the range of a set of numbers is the largest value in the set minus the smallest value in the set. Note that the range is a single number, not many numbers. Range of the Function F - the set of all the numbers f(x) for x in the domain of f.
Rate - a certain percent of the principal which indicates the interest on one dollar for one year; the number denoting how many hundredths of the base are to be taken. Ratio - a rational number of the form a/b where a is called the numerator and b is called the denominator, a comparison of numbers, the quotient or result of one quantity divided by another (fraction). Rational Number - a number that can be written as a fraction with integers as the numerator and denominator. Real Axis - the x-axis of an Argand diagram. Real Numbers - consist of both the rational and irrational numbers. Real Part - the real number x is called the real part of the complex number x+iy where x and y are real and i=sqrt(-1). Real Variable - a variable whose value ranges over the real numbers. Reciprocal of a Number - the number need to multiply to get 1 as the answer. Rectangle - a parallelogram with four right angles and four sides. Rectangular Coordinate System - a plane made up of an x axis (the horizontal line) and a y axis (the vertical line). Rectangular Solid - a volume bounded by rectangle faces. Recursion - given some starting information and a rule for how to use it to get new information, the rule is then repeated using the new information. Reduce - to rewrite a fraction in lowest terms. Reflect - to repeat an image by flipping it across a line so it appears as it would in a mirror. Reflex Angle - an angle between 180º and 360º. 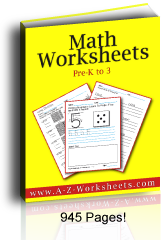 Regrouping - to rearrange quantities in place values of numbers during calculations. Regular Polygon - a polygon whose side lengths are all the same and whose interior angle measures are all the same. Relative Frequency - the number of items of a certain type divided by the number of all the numbers being considered. Relatively Prime - two numbers that have no common factors other than the number 1. Remainder - amount left that is left after division. Remainder - the dividend remaining when the quotient is not equally divisible by the divisor, also the name of the answer in a subtraction. Repdigit - an integer all of whose digits are the same, 11, 222, 333. Repeating Decimal - a decimal whose digits eventually repeat; .3333. Repunit - an integer consisting only of 1’s. Residual - the observed value minus the predicted value. It is the difference of the results obtained by observation, and by computation from a formula. Rhomboid - a parallelogram having its angles oblique, and its adjacent sides unequal. Right Angle - an angle of 90°, one side of the angle is perpendicular to the other side. Right Triangle - a triangle containing an angle of 90 degrees. Roman Numerals - a system of numeration used by the ancient Romans, seven letters of the Roman Alphabet: I, 1; V, 5; X, 10; L, 50; C, 100; D, 500; M, 1000. Root - one of the equal factors that will produce it. Root of a Polynomial - solutions when the polynomial is set equal to zero. Root of Unity - a solution of the equation xn=1, where n is a positive integer. Rotate - to rotate an object in a tessellation means to repeat the object by spinning it on a point a certain angle. Round-off Error - the error accumulated during a calculation due to rounding intermediate results. Rounding - the process of approximating a number to a nearby number. Ruled Surface - a surface formed by moving a straight line (called the generator). Rusty Compass - a pair of compasses that are fixed open in a given position. 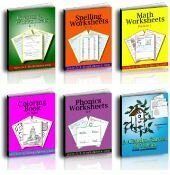 I hope that you've enjoyed this list of words that start with R. If you'd like a complete math glossary, print our free Math Dictionary to put in your binder or keep at your desk.